As part of my home entertainment setup for my new place, I’ve been evaluating HTPC options to bring all my media content to the living room TV. Over the next few weeks I will be reviewing the different software and hardware solutions that I have had personal time with. Historically I have been a big fan of Windows Media Center, but now the market is saturated with options, so making a decision is a lot harder. First up lets talk about XBMC and where it stands as a media center platform on Windows. XBMC or Xbox media center is an open source application created for use on a hacked first generation Xbox. Although it has a huge fan following on the Xbox, this review is limited to the windows version of it. The default skin for it isn’t very aesthetically pleasing, however there are two gorgeous skins (Aeon and MediaStream) available that make it a viable option for the living room. All the screen shots in this review are taken using the Aeon skin. TV shows are a little misleading, since it doesn’t really have DVR functionality. They are actually shows that already exist on your computer. So technically Videos, Movies and TV Shows are the same thing however its nice that they are separated out. I’m very impressed with the customizability of XBMC; since its open source, its being actively worked on constantly, especially in the skins department and you can change backgrounds, fan art (more on this later), menu items etc. to make it look and function exactly as you you would like it. XBMC has two main views for you to get at your content. The Files view is generally used to manage and add content, while the Library view is for every day use of browsing and playing your content. Below are some images on what that looks like. 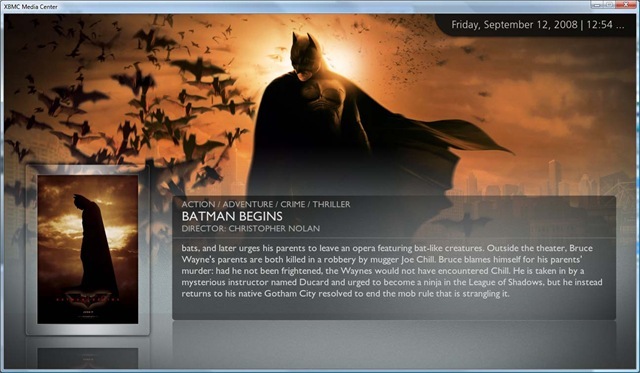 XBMC uses the concept of fan art which is extra artwork that is used as a background when content is selected. This reflects the context of what content is selected. Below are some screen shots that reflect it. This currently doesn’t work for music (as far as I know). 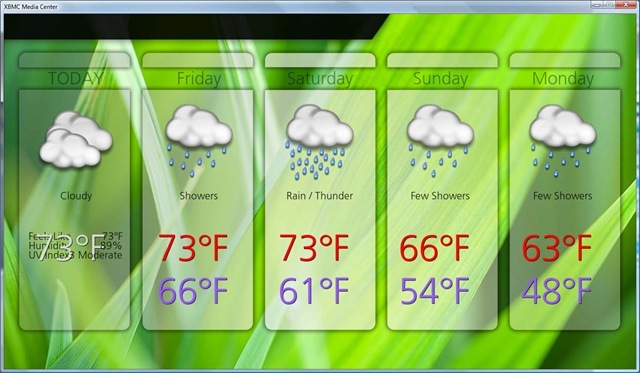 This is a standard media center weather application, although it is nice that it is added by default. As you can see from the screenshot above, some details of the skin still need some work. But on a whole things look very good. XBMC for windows is still in its early stages, so there are some kinks that still need working out. On my Vista machine there are times when it crashes for no apparent reason, however its still very usable. When you download a skin you need to unzip it into the xbmc skins directory; which is C:\Program Files\XBMC\skin\ if you used the default installation directory. You then open up xbmc and goto Settings -> Appearance and you’ll see your skin popup. how did you get the movie info stuff on your movie thumb nails. I’ve been trying to configure mine to do it but it just won’t work, is there a setting i’ve over looked – how did you do it. Well .. i’ve been testing this stuff today on 3 computers. On windows 7 – no image just sound for my movies (codecs exists since it’s working in Bsplayer and Media Player). windows xp laptop 2 – same behaviour. on laptop 1 still indexing my movies (it’s been doing that for one hour). Wasted around 3 hours of my life looking in all kind of documentations how not to use the integrated video player but to use bsplayer. Fed up with xml configurations, nothing worked. And by the way: to make this work you need around 3 lines of code to start the player and let’s say 10 lines of code for the settings to save the path. So looks very nice but that’s all in my humble opinion.